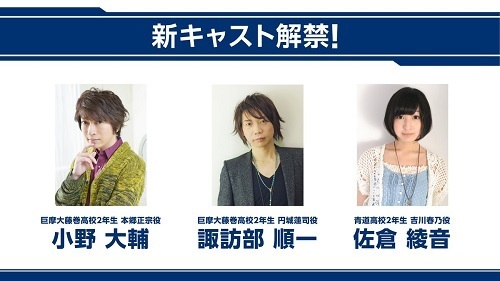 The AnimeJapan 2019 stage event for the previously announced Diamond no Ace: Act II TV anime announced additional cast members and theme song information. Ayane Sakura (Gotoubun no Hanayome) will be replacing Yurika Endou, who retired last year, for the voice of Haruno Yoshikawa. The opening theme song will be "Hajimari no Uta" by GLAY while the ending theme song will be "Golden After School" by OxT. The anime will air on Tuesdays at 5:55 p.m. via TV Tokyo systems, followed by AT-X, and BS TV Tokyo starting April 2. Sad I had not time to catch up to this, I will have to skip watching this while airing. 2nd april :O that's so close! Good now I've got myself something that I can counting days too it :D first Diamond no Ace Act II then Oregairu 3rd season. Time to check this franchise out! More hype! I'm loving the smoother character designs in the teaser. Apparently, this will be 52 episodes according to recent BD/DVD listings. I am waiting this like a child!!! Hype over 1000!! Yes, I'm so hyped about this.